Place 2-4 ice cubes in a cocktail shaker. 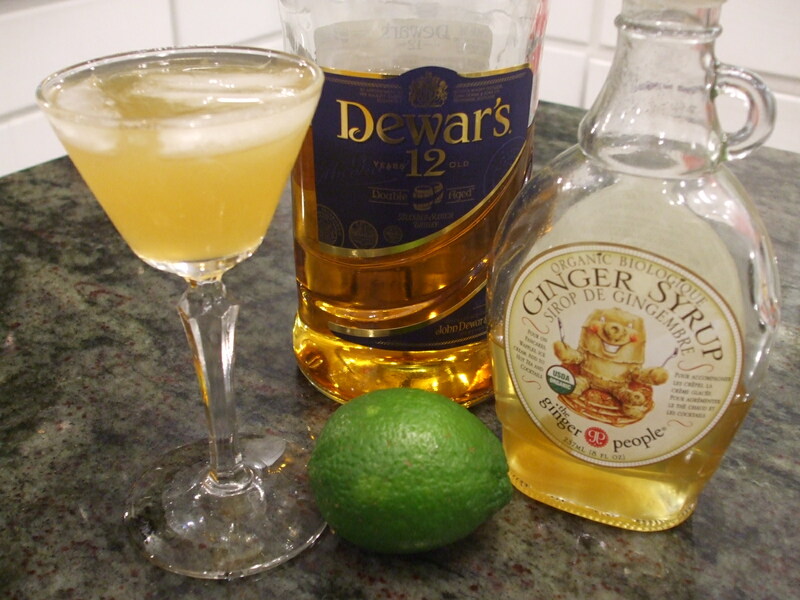 Measure ginger syrup first so subsequent liquids will help dissolve any remaining syrup in measure. Add to shaker. Then measure lemon juice and add, then blended Scotch and add to shaker. Cover and shake well. Pour entire contents into small wine glass and float 1/8 oz of Laphroaig Scotch on top. Sometimes I add a little more ice if there is room in the glass. Careful – these are so delicious you can really knock your socks off in a hurry as they pack a punch! Enjoy! This next recipe is similar to The Cure and almost as delicious! Measure out Syrup and pour into shaker with ice. Squeeze limes into measure and swirl around to get out as much syrup as possible and then measure out Scotch to rinse out all of the above and pour into shaker. Cover and shake with ice and pour into small wine glass. The Southern Baptist is this recipe made with Rye. I renamed it the Southern Presbyterian as this is the main church in Scotland! I like Rye, but I like Scotch better. This recipe is similar to a Cablegram. The main difference is less lime juice and topping with club soda. Some recipes for a Cablegram call for rye instead of Scotch, also, but of course that is not as tasty. Both the Southern Baptist and the Cablegram have variations where you can use ginger ale and lemon juice, or even Sprite. I definitely suggest you look up the variations and try them if they suit you. I am giving you the versions I like best, but you can discover what you like best through the fun of mixing and trying your own! In glass add Scotch, lemon juice and sugar. Stir to mix well and add Ice. Fill the glass with ginger ale and stir. Add lemon wedge for garnish. You can substitute lime juice for lemon juice and sprite or club soda for ginger ale. Here is another favorite of mine. 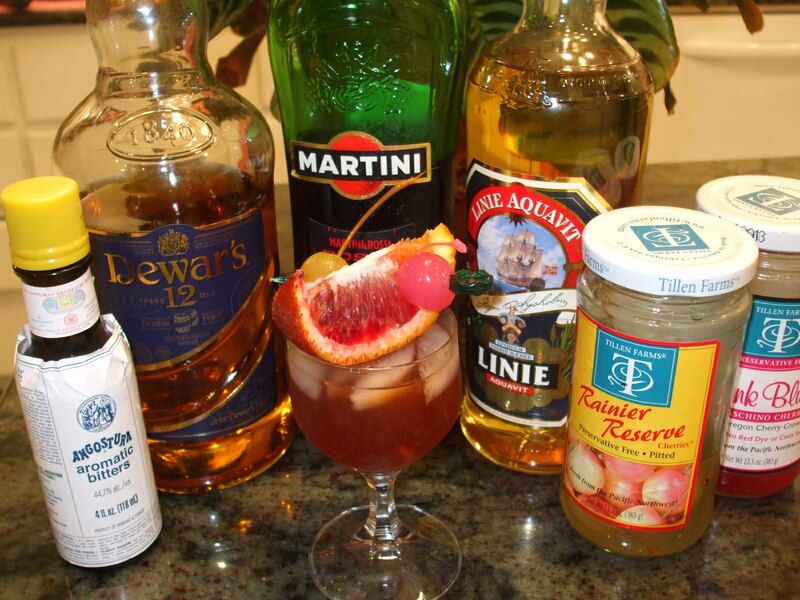 Remember you can make any of these cocktails with any Scotch you like. You may want to experiment to see which flavors meld well together. My preference is to use a good blended Scotch like Johnnie Walker Red or Dewer’s 12 in a cocktail, but I have tried mixing some of my favorite single malts, too. In Cocktail shaker add liquors and ice cube. Quickly stir to chill drink and then pour into martini style glass, straining out ice cube or not, to taste. Add Lemon Twist and enjoy while it is cold. There are many variations of this drink. One main one is to serve it over ice in an old fashioned glass. 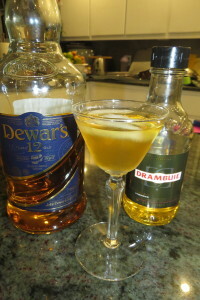 Another is to change the ratio of Drambuie to Scotch. Drambuie is very sweet so you may to start out with a ratio of 1/4 oz to 1 oz. of Scotch and then you can add in increments of 1/4 oz to see what your preference is. The recipe I have here is how I best like this drink. I also recommend making them in these small amounts for two reasons. One, it is best sipped cold and undiluted, so making a small drink helps achieve this. Also, you are drinking pure alcohol with no mixer, so it is better to take it in small doses so as not to have too much too fast. Place Ice into glass and pour in Scotch then Amaretto. Lightly stir and enjoy. This is from Whisky Cocktails by David Biggs. So simple and yet so delicious. Mix Scotch and Vermouth over ice in shaker and strain out into glass. 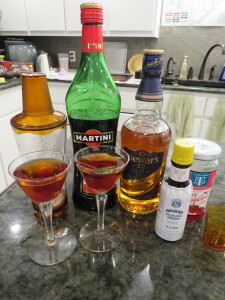 Shake a few drops of bitters and add the cherry. Enjoy while cold. Here is my own recipe for a wonderful party punch! Mix all ingredients together. Can be prepared ahead of time and put in a pitcher and then poured in punch bowl when guests start arriving. I recommend serving ice on the side so people can ice if they want to avoid any dilutions. Please use fresh lemon juice and fresh orange juice because it really makes it delicious. Squeeze the orange quarter like a lemon wedge into the measuring cup and then remove any seeds before adding it to a shaker. Put all the rest of the ingredients in the shaker with about 4 ice cubes and sake vigorously to dissolve passion fruit syrup. Pour all of the drink with ice into class and garnish with wedge of orange. This is a version of a Sea Breeze made with Scotch instead of Rum. It definitely has a sharper taste from the Scotch. I recommend experimenting with different Scotches to find one that suits it for you. This is simple and absolutely scrumptious! As always, use the Scotch that you like best. You may increase the Scotch to 2 oz, but I like 1 oz. because it doesn’t diminish the sweetness of Crabbies and then I can have another one! Combine all in shaker and shake well, strain into small wine glass or pour in with Ice. Garnish with piece of orange and cherries. This is a bit unusual, but may appeal to you if you are looking for something different. I made it here with a blood orange which is quite a nice show piece for company. If possible, use traditional Irish Coffee glasses that have the lines on the glass. The first line is for the spirit, the second for the coffee and then you float the cream on the top. Pour the Scotch in first, then the hot coffee. Add the sweetener now and stir. Then carefully float the heavy cream on the top. Enjoy while hot, sipping the Scotched Coffee through the cream. You may feel like garnishing the top of the cream with nutmeg or chocolate if you really want it to look fancy! A variation of this is Scotch and Hot Chocolate. Make your hot chocolate as you like it and then add 1 oz. of Scotch to it and top with whipped cream. This is a treat you will be amazed by! It is so good! 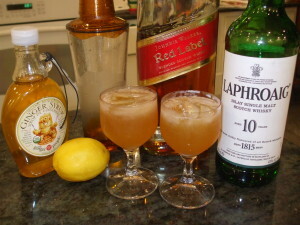 This is a variation of Highland Coffee, and is called “Scotch Mist” in Whisky Cocktails by David Biggs. Pour the Scotch in a the teacup and add the tea. Sweeten with honey and then float cream on the top. Or stir in cream. 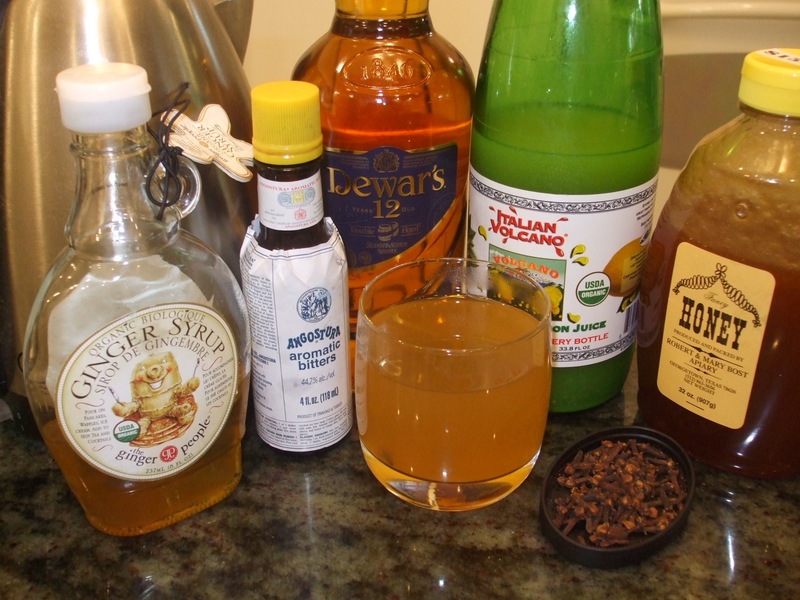 These three hot beverages with Scotch are all so good, you will be amazed! The flavor of Scotch goes so well with Coffee, Tea and Chocolate, and Scotch is a warming drink, often, so works well when you want a hot drink! In a cocktail mixer add some ice and the Scotch. Squeeze the lime wedge, adding just a small amount to the Scotch. Shake to mix and chill, and then strain into the coupe glass. Float the cream on top. This is from Whisky Cocktails by David Biggs. It is unusual but tasty. I would recommend adding a small amount of the lime juice and taste it and then add more if you can’t taste it. 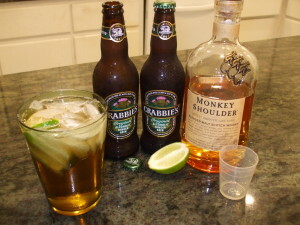 You want to get a good balance between the smoke of the Malt, the sour of the lime and the sweet of the cream. You don’t want to overpower any one flavor. If you don’t care for Peaty Single Malts, go ahead and try this with any Scotch you do like, but the drink was devised with the smokey malt in mind. In your glass add sugar, bitters and water. Stir with muddler to dissolve sugar. Add half of orange and 1 cherry and muddle with sugar and water to finish dissolving sugar. Add ice and then pour Scotch in last and using muddler, stir up everything. Place other half of orange and cherry on a garnish pick and place in top of drink. You can add a little more water if you like. Put honey and syrup in mug, add lemon juice. Add some boiling water and stir to dissolve honey and syrup. Add cloves and bitter. Add Scotch. Stir well and then add boiling water to taste or fill up mug and stir well and drink while hot. This tastes much like The Cure, but is perfectly acceptable at 2pm in the afternoon!